Up to that point, with Al Pacino playing lapdog to Ryan O’Neal, the startlingly beautiful Téa Leoni as an emotionally bereft television starlet, and a smattering of good actors in great roles, PEOPLE I KNOW seemed to stagger the way of those listless, shiftless, self-referential High Society movies about unethical publicists, dumb actors and immoral politicians. (Yawn.) But as it happens, there is a powerful little movie lurking beneath the façade of PR puerility. Al Pacino is New York publicity agent Eli Wurman, whose phone doesn’t ring as much as it used to. He panders to his Last Big Client, actor Cary Launer (O’Neal), to the extent of babysitting Launer’s latest fling, Jilli (Leoni), to bundle her out of town on Launer’s request. But in the course of tagging along with the flighty Jilli on one of her regular all-night industry benders, Eli gets very bent and Jilli gets very dead. Desperately attempting to pull together a publicity event (which no A-Listers want to attend, despite his puling at their heels), Eli must contend with not only the shadowy types who killed Jilli, but with the real scary people who inhabit the nether regions of high society – politicians and clergy. After seeing him in various dispensable B-roles, Richard Schiff comports himself very respectfully as a powerful politician, as does Bill Nunn, as a feisty clergyman. 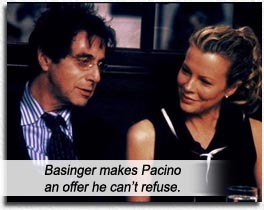 Pacino plays exhausted better than almost anyone and this movie’s breakneck PR pace, coupled with Eli’s staggering gait and slurred small-town delivery makes us want to get stranded on a desert island as respite from the dogged ulterior motives he encounters – and utilizes himself – in his minute-to-minute tribulations. His doctor (Robert Klein), though advising him of how close he is to total collapse, prescribes him drugs to keep him standing. Victoria (the still-luminescent Kim Basinger), widow to Eli’s brother, also senses his cliff-edge demeanor and enjoins him to accept her offer of warmth and quietude on her farm. Before it’s too late. And “too late” is now. Just as Eli’s hard work has paid off, with blurbs in the papers, a mention on the Regis show and a promise of bedding down with Kim Basinger; just as we are threatened with a sappy ending – the movie suddenly gets New York on us, disallowing Eli even one moment to savor his comeback, as that murderous element that he encountered with Jilli and almost forgot about, comes back to ensure there are no loose ends. As Eli’s phone starts ringing again, there is no one left to field the calls. Starring: Al Pacino, Kim Basinger, Ryan O’Neal, Téa Leoni, Richard Schiff, Bill Nunn, Robert Klein.